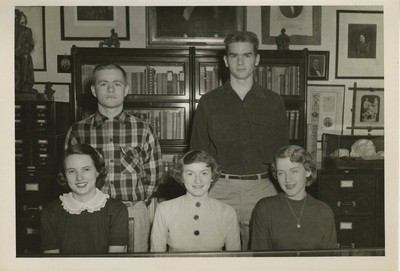 Sophomores class officers of '55 are inside an office space, gathered for a photo. This is a smaller version of the digitized photograph with the identifier "Class Officers_1955_002_Sophomores," and the participants in this photo are identified on the back as the following: Lary Davies (President), C.W. Sandifer (Vice President), Jackie Davis (Reporter), and Wanda Littleton (Secretary). Can be found in LMU Railsplitter 1955, page 34.